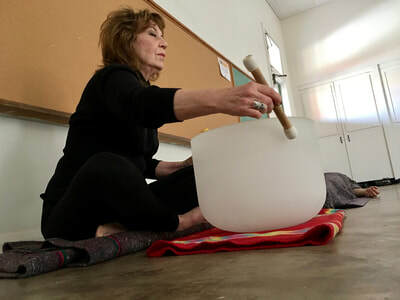 ​Join us for a special weekend of renewal, combining chakra yoga and pure tone quartz crystal bowl vibration. This signature program was created by the mother-daughter team of sound pioneer Jovita Wallace and yoga instructor Morgana Wallace Cooper. This powerful experience is promised to release, rebalance and expand your quantum body. Re-aligning the energy of the mind/body/spirit dimensions is necessary for a sense of wellbeing. The unique combination of chakra balancing and yoga will empower participants to achieve maximum results. Your three-day experience will be enhanced by the beauty and comfort of our beautiful inn and conference center in the heart of the Sonoran Desert, surrounded by millions of acres of unspoiled open wilderness. The area is home to more than 1,000 species of plants and animals. Splendor abounds in breathtaking vistas and vibrant sunsets. It is a place of peace and solitude. ​We will also have special musical guests, Matthew Thomas, who will offer soundscapes from his Geoscience sound collection and David Knight of Sedona creating landscapes and musical space for meditation and healing. Don’t miss your chance to be a part of this exclusive event, sign up now! Registration is limited to ten participants, which will allow for the creation of an intimate community of practice and provide greater access to the instructors. Your body is like an orchestra. Every player – every organ and bodily system – needs to vibrate at its highest frequency. This program is designed to strengthen, transform and align the energy fields - your chakra system. During our three core sessions, we will focus on the physical body, the transformational body and the causal body, or mind body spirit. These comprehensive sessions have been created to educate and allow for open dialogue about the energy centers of the body. We will then apply this knowledge by practicing movement and experiencing sound vibration therapy in order to access, stimulate, and calm these energetic centers. 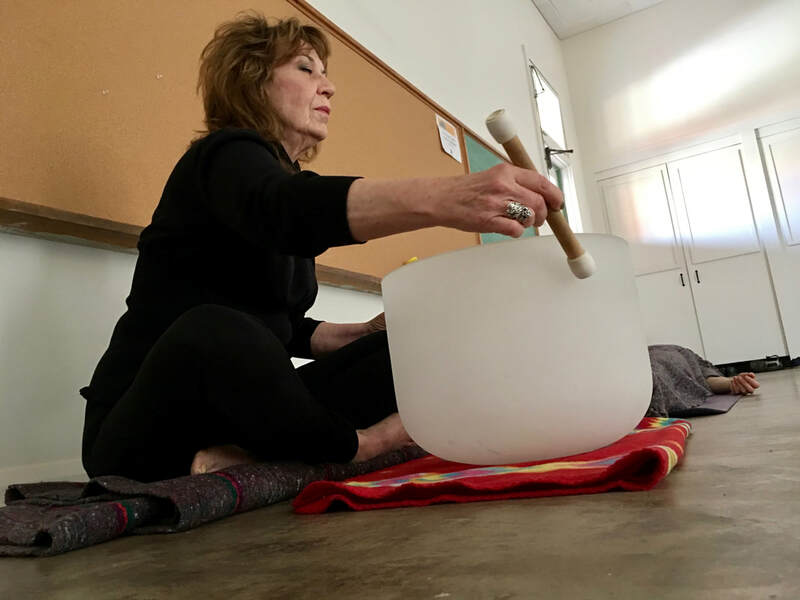 After 75 minutes of yoga, 20 minutes of crystal bowl sound healing will continue to move the energy flow to release unwanted information held on a cellular level and expand your subtle body energy field. Seven crystal bowls will be integrated into the three sessions. The sound vibration will go to exactly where it is needed. In addition to these three core sessions, we will have an opening and closing session, and Saturday morning wake up yoga and meditation. Ajo is a small town with a lot of fantastic chefs! Throughout the weekend we will feature nourishing interpretations of local Southwestern, Northern Mexican and Tohono O’odham Native American cuisine to further enhance your Sonoran Desert experience. Sunday lunch will feature a Chakra Buffet designed to stimulate and activate all seven chakras. Jovita Wallace, Raven Wildhorse, is the Founder/Director of Being In Balance Sound Wellness. As a consultant, educator, speaker, shamanic healer, psychic medium and artist, she brings to her work years of study and unique gifts. Over the past 20 years she has received much public attention about her work with sound and color vibration, bringing the healing nature of sound into mainstream. Jovita has been filmed for Fox TV, “Good Day New York” and cable TV, “Alternatives,” and Channel 11 New York News. She has also been featured in The New York Daily News, The New Jersey Star Ledger and many other magazine publications. As a presenter at the Medical Spa Conference at the Jacob Javits Center, New York, NY, she introduced color illumination and pure tone therapy as the medicine of the 21st century. Jovita has many programs available as well as certification courses and a private practice. soundscapes and musical spaces for meditation and healing. The $475 retreat fee covers all meditation and yoga sessions and four meals from Friday dinner to Sunday lunch. Accommodations are an additional charge and not included. ​*Early Bird Registration $425. Register and pay the deposit by January 15th to receive this discounted fee. This retreat is only open to ten attendees, so space is limited. Upon completion of the registration form we will call you to hold your spot with a $100 registration fee, which will serve as your deposit. Payment in full is due upon arrival. Individual services (massage treatments, polarity balancing, one-on-one yoga, chakra assessment consultations) will be paid directly to the practitioner. For overnight accommodations go to http://www.sonorancc.com or call 520-373-0804. Cancellation Policy: After February 15th you will be responsible for the full retreat fee. ​Click here learn more about my upcoming events.